New York Yankees 4, St. Louis Cardinals 1. The Yankees capture the last three games to win their 10th World Series title. Spud Chandler wins two games for the Yankees, including a 2-0 shutout in Game 5 at Sportsman’s Park. Key hits for the Yankees include Billy Johnson’s three-run triple in Game 3 and Bill Dickey’s two-run homer in Game 5. Mort Cooper’s complete game in Game 2 gives St. Louis its only win. This is the first World Series film ever produced by Major League Baseball. 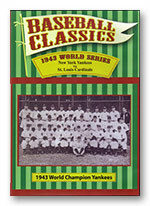 The DVD also includes rare news footage of the first three games of the Series at Yankee Stadium and 1953 interviews with Walker Cooper and Johnny Lindell. B&W. DVD.